In Extinction Machine Jonathan Maberry has Joe Ledger and Echo Team delving into the mysteries of ancient alien artifacts. This is yet another, the fifth one in fact, exciting adventure of Joe Ledger and the Department of Military Science. I hope there a dozen more. I enjoyed Extinction Machine more than the last one, I find the subject more interesting and a little bit different than other books I have been reading lately. 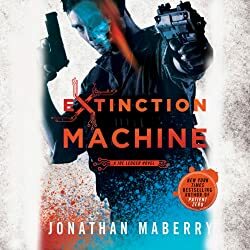 In Extinction Machine, the fifth Joe Ledger book by Jonathan Maberry, the DMS must go up against someone – or something – in search of new technology that could bring about world war. The president of the United States vanishes from the White House. A top-secret prototype stealth fighter is destroyed during a test flight. Witnesses on the ground say that it was shot down by a craft that immediately vanished at impossible speeds. All over the world, reports of UFOs are increasing at an alarming rate. And in a remote fossil dig in China dinosaur hunters have found something that is definitely not of this earth. There are rumors of alien-human hybrids living among us. Joe Ledger and the Department of Military Sciences rush headlong into the heat of the world’s strangest and deadliest arms race, because the global race to recover and retro-engineer alien technologies has just hit a snag. Someone – or something – wants that technology back. I rate Extinction Machine a 9 out of 10 and recommend it to anyone following the Joe Ledger series. Posted in Audio, Books, Fiction. Jonathan Maberry’s Joe Ledger is back in action. I don’t want to say anything about what is going on in Assassin’s Code as it would give away the most interesting thing about it. Suffice to say that Joe and Echo team are faced with another challenge that threatens the world while more personal threats step out of the shadows. Ray Porter continues to do an amazing job narrating the Joe Ledger series and bringing all of the characters to life. When Joe Ledger and Echo Team rescue a group of American college kids held hostage in Iran, the Iranian government then asks them to help find six nuclear bombs planted in the Mideast oil fields. These stolen WMDs will lead Joe and Echo Team into hidden vaults of forbidden knowledge, mass-murder, betrayal, and a brotherhood of genetically-engineered killers with a thirst for blood. Accompanied by the beautiful assassin called Violin, Joe follows a series of clues to find the Book of Shadows, which contains a horrifying truth that threatens to shatter his entire worldview. They say the truth will set you free… Not this time. The secrets of the Assassin’s Code will set the world ablaze. 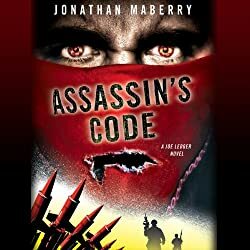 I rate Assassin’s Code an 8 out of 10 and highly recommend it to fans of the Joe Ledger series. I was looking for a good shot’em-up and realized I had bought Hitman Absolution from Steam on sale a long time ago and hadn’t played it yet, and even better I could play it on my iMac in MacOS instead of booting into Windows Bootcamp. I have played most of the other Hitman games and liked some more than others. A couple of them have been really awesome. I clearly remember a scene in an opera house where I was forced to harm a police officer for the first time in any of the games, that was really hard for me, I almost stopped playing the game because of it. But after dying and restarting the level for what felt like 100 times I was able to complete the mission without killing any cops. Knocking them around a bit is ok. In Hitman Absolution the only mission that came close for me was in Chinatown with a ton of witnesses and a chase that led to me wearing a furry suit. The gameplay was ok but not great, I took a couple of week long breaks while playing it and coming back to it I had to re-learn a lot of the controls. Keyboard and mouse all the way. The story line was not very interesting to me, definitely the worst of the series. I feel like the core of its problem is that to much time and money creating infuriatingly long cut-scenes instead of honing the gameplay. The cut-scenes ruined the game for me, I feel like I spent 25% of my time playing the game and 75% watching boring cut scenes. For a 2012 game played on a Late 2013 27” iMac the graphics were impressive, at full resolution the game was smooth-ish with good framerates that only slowed noticeably when there was a lot going on. I don’t remember what I paid for the game, but if it was in the $10 range I am happy with it, but will probably never play it again. I rate Hitman Absolution a 4 out of 10 and only recommend it to people who are playing their way through the franchise or for game developers to learn how not to do it. Listening to Ivanhoe caused me to read more Wikipedia articles than any other book or audiobook. I looked up info on the Normans, the Saxons, and a bunch of different royals. But the story never caught my attention. It was interesting from a fictional historical perspective, but the pacing and dialog never grabbed me… Until I realized the narrator is the same guy who reads the “Lies of Locke Lamora” series by Scott Lynch. Michael Page is a great narrator and for the rest of the book I pretended that it was the Gentlemen Bastards on another adventure instead of Ivanhoe. That worked until the Robin Hood story kicked in and shattered that illusion. Overall I enjoyed the story, but I will probably not listen to it again. A century has passed since the Norman Conquest, and England is still a colony of foreign warlords. Prince John is plotting to seize the throne from his brother, Richard the Lion-Hearted, and Robin Hood and his merry band are making fools out of the Sheriff of Nottingham. Wilfred, knight of Ivanhoe, the son of Cedric the Saxon, is in love with his father’s ward, Rowena. Cedric, however, wishes her to marry Athelstane, a descendant of the royal Saxon line, whom Cedric hopes will restore the Saxon succession. With a colorful cast of chivalric knights and fair ladies, this action-filled novel comes complete with feats of derring-do, the pageantry of a tournament, and a great flame-engulfed castle – all of which makes it the most enthralling of Scott’s creations. I rate Ivanhoe a 5 out of 10 and recommend it to those interested in history.